Small, artful Indian destination with dishes that allow for experimentation. : Tucked away in a line of shops, this tiny restaurant could almost be invisible. 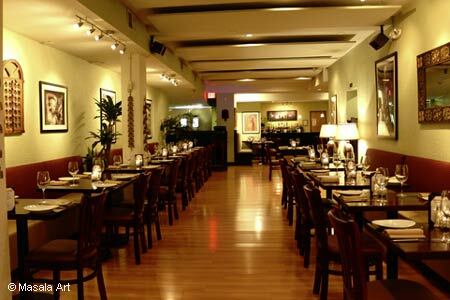 But its interior reveals a full display of artwork on the walls and an elegant table setup. Perhaps the best time to stop in for a bite is midday, when you can access the buffet line. While the choices are limited to what the chef mixes up for the day, the price is certainly right. But you will get a better sense of the kitchen if you order off the menu: Chicken 65, a South Indian preparation, and the lentil dumplings make fine starters. Fortunately, dishes not usually found at other Indian places are available, so here is a chance to experiment. How about lamb curry with beetroot, or potatoes with dried pomegranate seeds? Even several of the meal-enders are unusual: rabarhi, a milk dessert, and khurmani ka meetha, showcasing apricots. Also located at the South West Waterfront, 1101 4th St. SW, Washington, DC, 202-554-1101.